It’s almost time to say farewell to our new darlings, Harry and Meghan, the Duke and Duchess of Sussex. 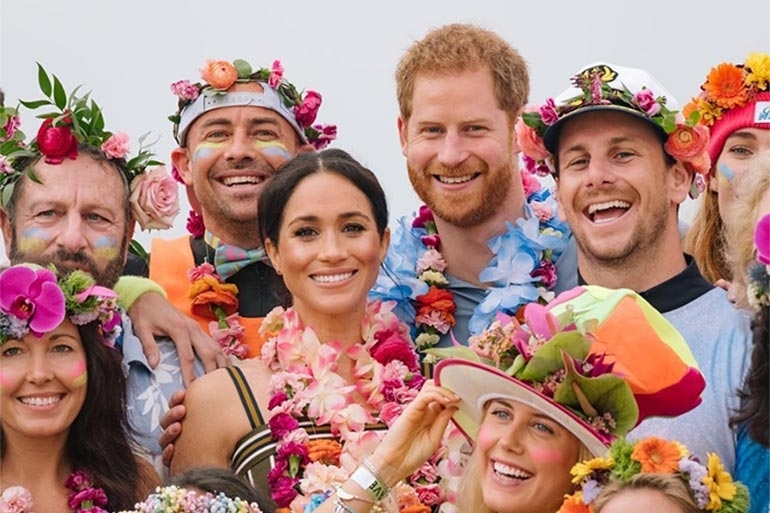 The Royal couple won us over with their kindness, compassion and most of all, their adorable and ever present ‘loved up’ glow. This tour began with the exciting news that Meghan is pregnant with the couple’s first child, who will be seventh in line to the throne. Oh yes. I was there. Screaming wildly alongside the thousands who lined Government Drive in Melbourne. I had my own little Princess with me and we witnessed their gentle touches, their sneaky glances at each other and their incredible kindness shown to strangers. And well… I’m not ready to say goodbye just yet. 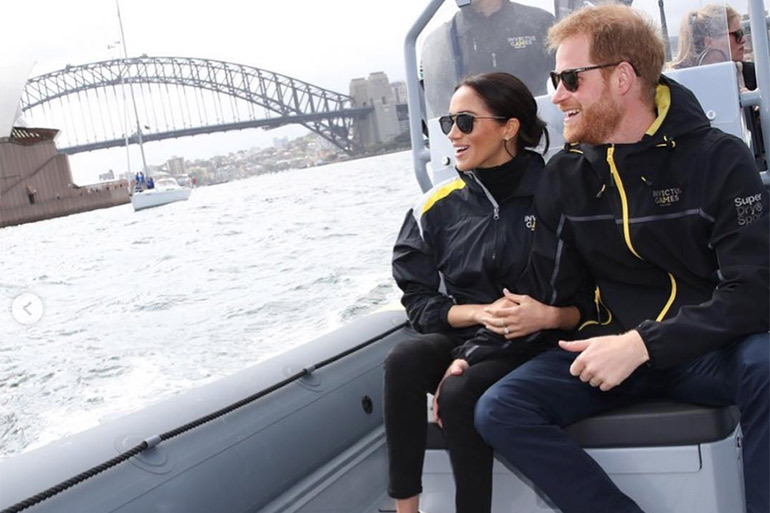 Instead, let’s relive our 10 favourite moments of Harry and Meghan’s 2018 Australian Tour. Oh that look of absolute love that has set the world alight. 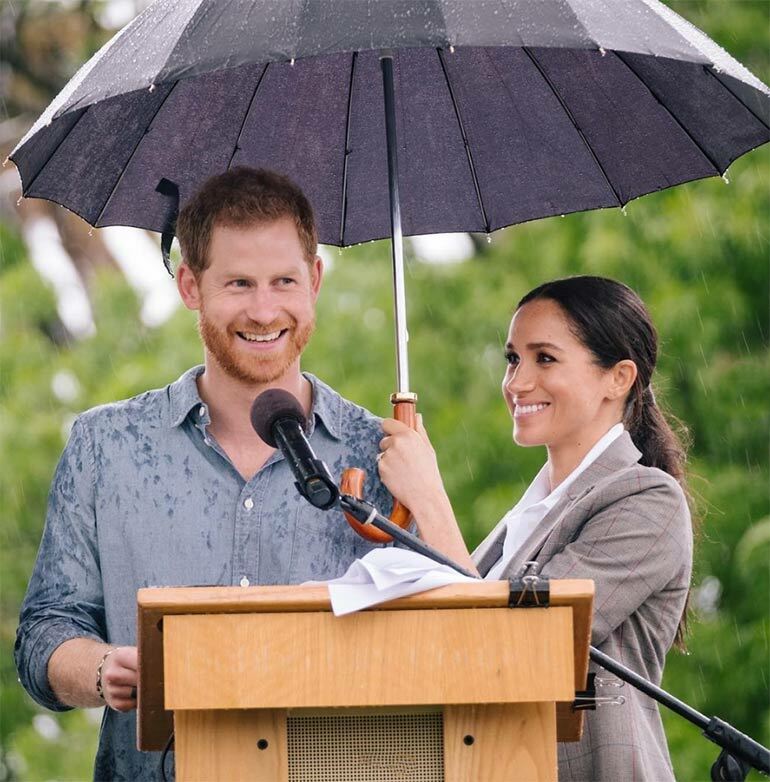 The shy lash flutter as the Duchess keeps the rain off her Duke and adores him silently with her eyes. Be still my beating heart! Forget the pomp and ceremony. 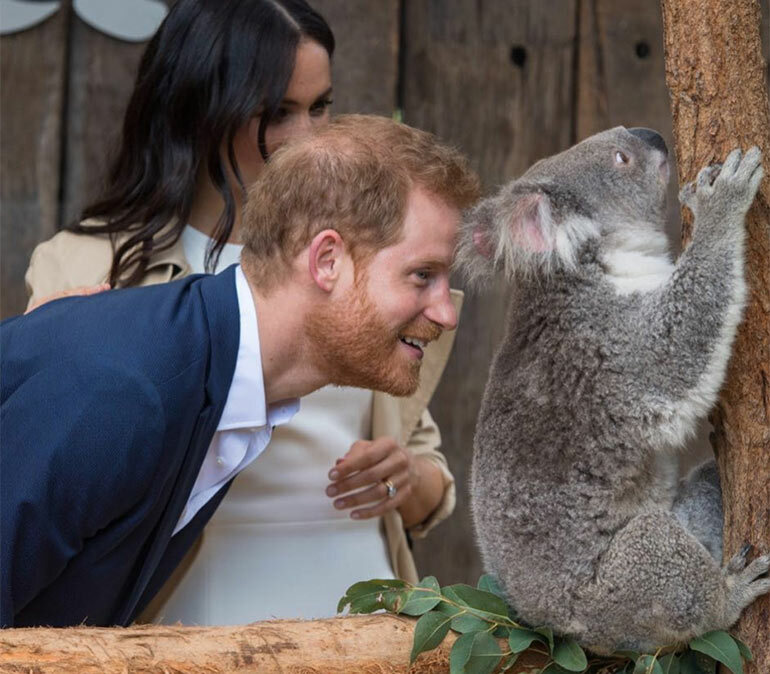 Harry showed he’s up with the local lingo when he jokingly referred to koalas as drop bears during a stop at Sydney Taronga Zoo. 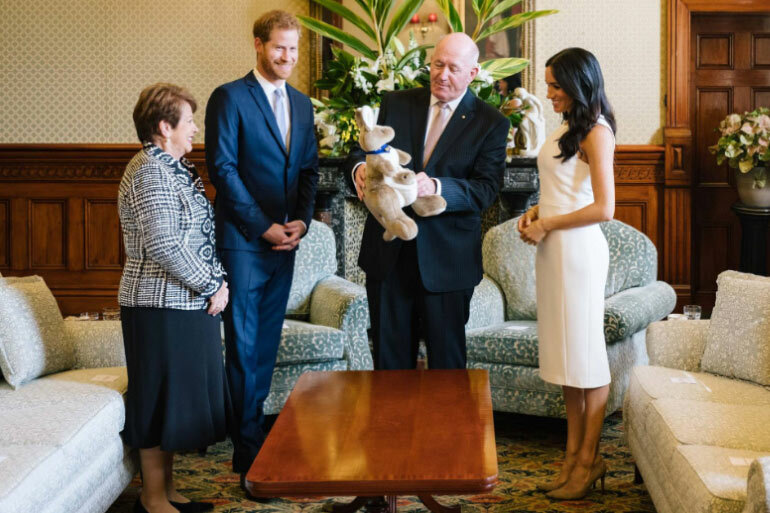 Harry and Meghan were also introduced to two little koala joeys, fittingly named ‘Harry and Meghan’, named as a wedding present from the people of NSW. Cu-ute. The Duchess just nails it every time. Meghan mixed pieces from Australian and New Zealand designers with classic British faves. Effortlessly switching from designer dresses to jeans with trainers and even a gold-painted pasta necklace (given to her by a little boy in Melbourne and worn immediately), we love that Meghan manages to look catwalk amazing in anything. And what about that daring flash of flesh on Fraser Island? Yes, it’s a ‘split’ from the more usual royal attire. And it’s even more interesting to note that the official Palace Instagram shared this picture. And why not? The times they are a-changing. 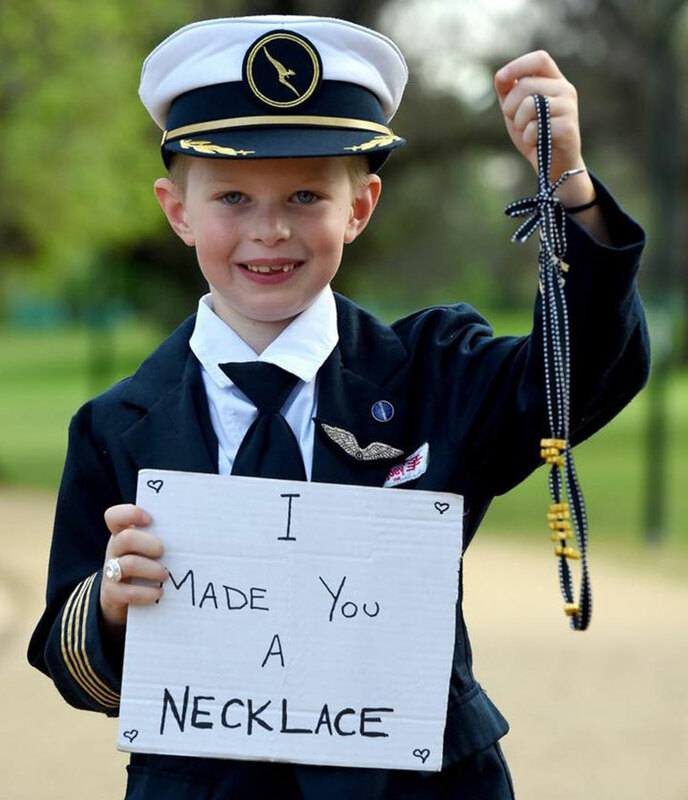 Melbourne schoolboy Gavin Hazelwood made this gold-painted pasta necklace for the Duchess and was thrilled when she put it on. He’s now selling them online to raise money for SIDS research. This inspiring event is the whole reason the Royals have blessed us with their presence. 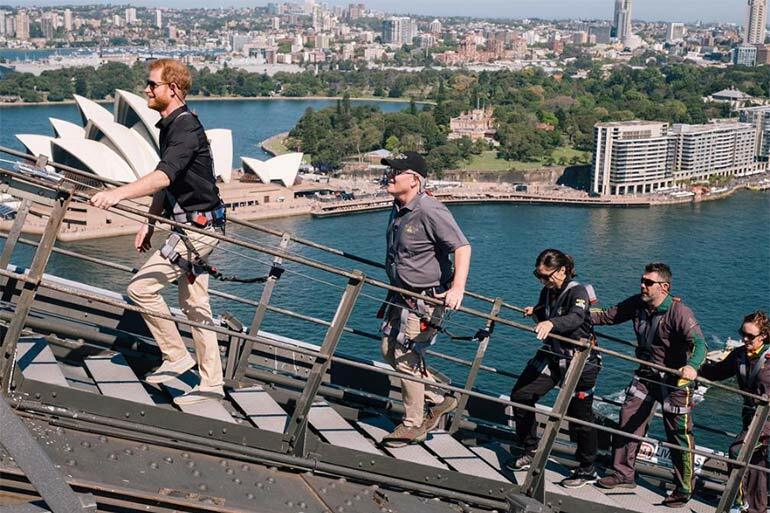 Prince Harry climbed the Sydney Harbour Bridge with our Prime Minister to raise the flag to mark the beginning of the Invictus Games Sydney 2018. Bravo, Harry. Such a fantastic way to give wounded service personnel the opportunity to compete in their chosen sport at an international level. Looking fit, Haz. 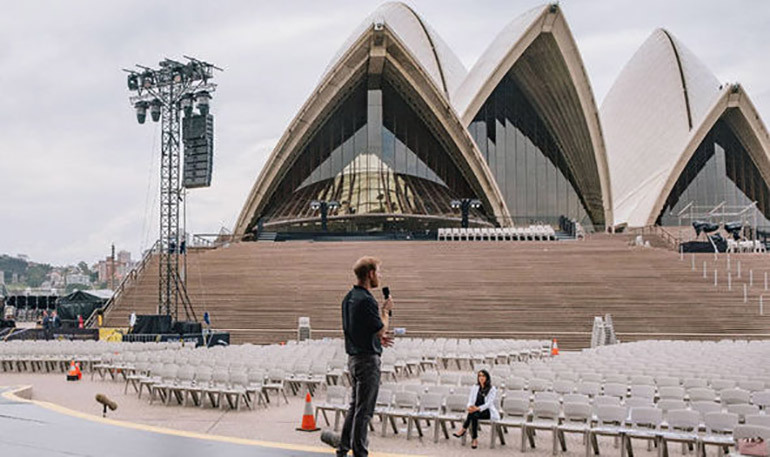 The perfect picture released by Kensington Palace, saw the Duchess sitting alone watching her husband rehearse his speech for the Opening Ceremony of the Invictus Games. So intimate and unusual not to see the couple amongst swarming crowds or minders. Third time EXCEPTIONALLY lucky! 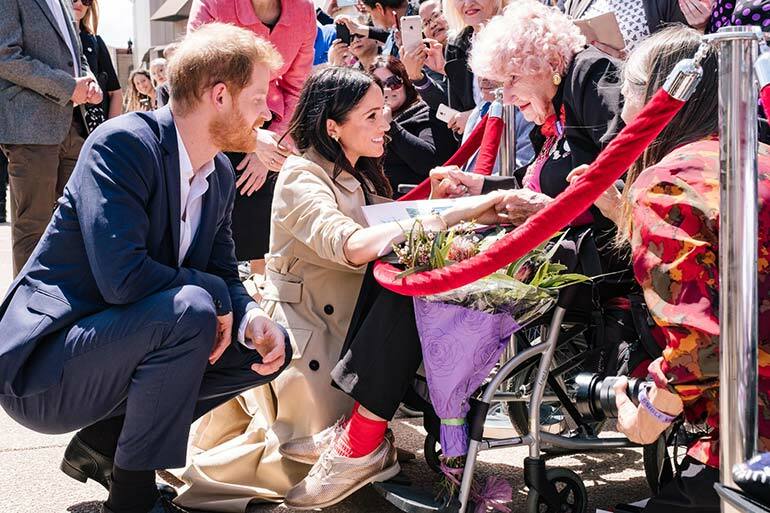 Harry again bumped into Daphne Dunne, a 98-year old war widow, in the Sydney crowd. 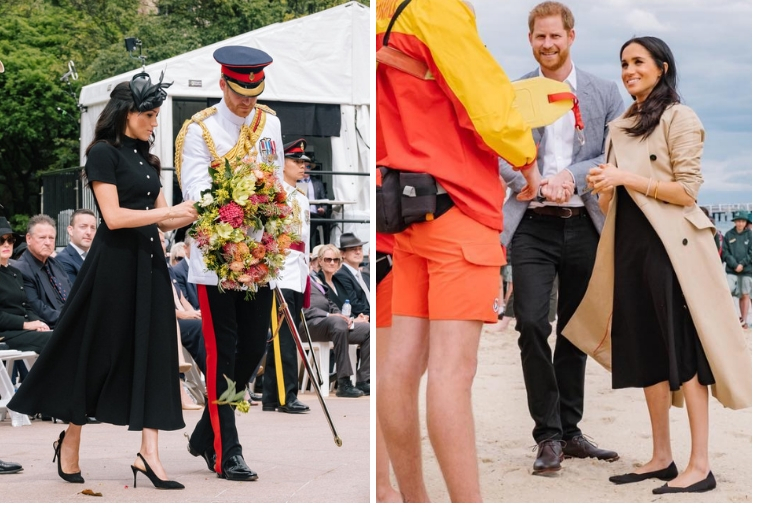 It was lovely the first time in 2015, when Harry spotted her wearing the prestigious Victoria Cross medal awarded to her late husband. It was very sweet when he found her again in 2017, and gave her a peck on the cheek like family. But it was incredibly touching when he found her a third time this trip and excitedly introduced Daphne to his new wife, who was clearly well aware of who this special lady was. 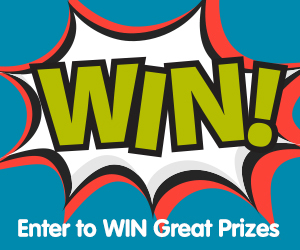 Oh Hazzler… DI-VINE! From the floss dance to the tram ride, Melbourne also produced another winning moment. India Brown, 19, from country Victoria, was absolutely overcome with emotion when she asked Harry for a cheeky hug. “You’re going to get me in trouble,” he grinned as he stepped forward for the embrace. Her delighted face says it all. Can she do no wrong? Intelligent, talented and sporty, too, it seems. 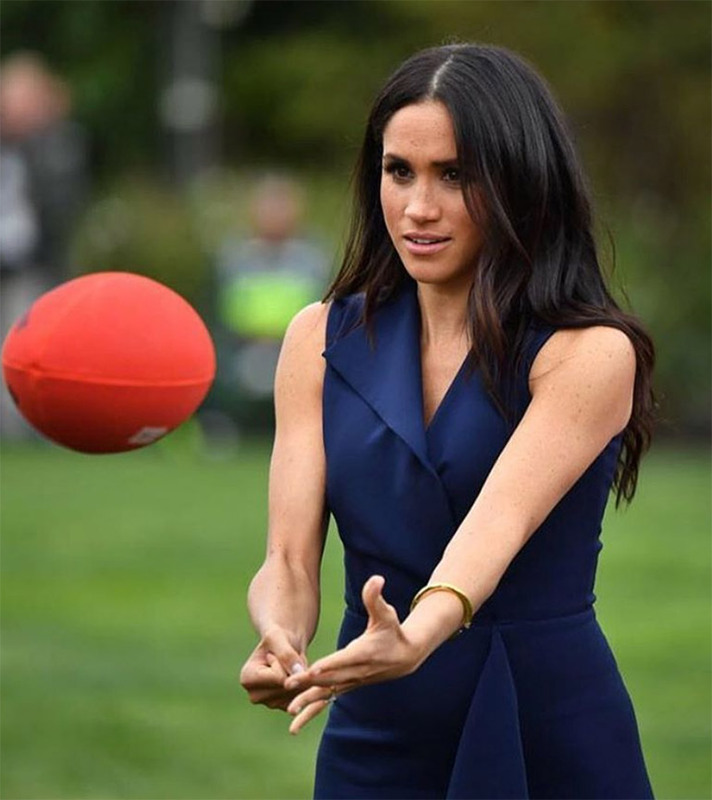 The Duchess got a close-up look at the mad game of AFL and showed she can handle a footy, even in a designer dress and heels. Those handball skills are on point! 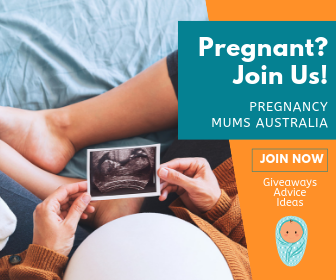 Quite exciting to note that us Aussies did it first! Kudos to our Governor-General Sir Peter Cosgrove and his wife Lynne, for keeping it real with a practical gift. A toy kangaroo with a little joey in her pouch called for some polite giggles and oohs and ahhs. But the best part was when a teeny tiny pair of baby ugg boots were handed to Harry. CUTENESS overload when it dawns on Harry’s face that these will be for their little babs. If you haven’t see this footage yet, where have you even been? 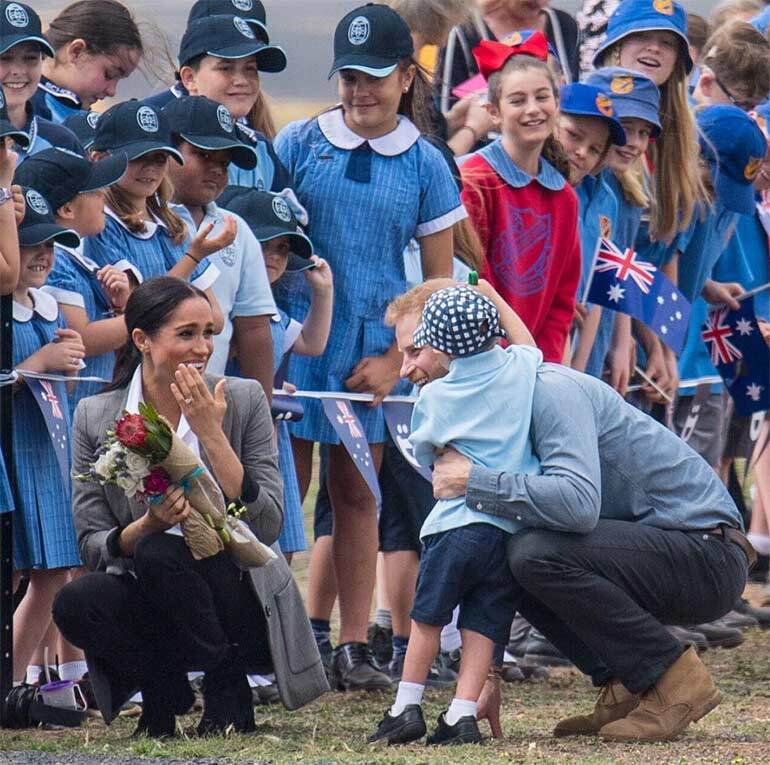 In Dubbo to welcome the couple, Luke broke out of line to give the Prince a special cuddle. Little Luke Vincent, 5, was having none of that ‘Royal Protocol’ business. He did what half of the population actually wanted to do and went straight in for a snuggle. Harry’s ginger beard clearly took his fancy. This was shortly followed by a warm embrace by the Duchess and a safe return to the arms of his new Royal friend. The final little head rub was just an adorable bonus. And, my friends, as I shed a little tear, that’s a Royal Wrap. To our special new mates, Hazzler and Megs, thanks for stopping by. You are welcome back anytime. If you are perhaps still not ready to call it a day, here is another little flashback gift for you from the time When Harry Chose Meghan. Or perhaps it is time to move forward and start the speculation about Royal Baby Names.